When was your last teeth cleaning? The American Dental Association recommends you get a teeth cleaning and oral examination at least every 6 months. If it’s been awhile since you’ve seen our Kalamazoo, MI teeth cleaning dentist, schedule your appointment today. Scheduling your teeth cleaning every 6 months is one of the easiest ways to maintain a healthy smile. During your dental cleaning, we’ll be able to remove plaque and tartar from the surface of your teeth. While brushing your teeth twice a day and flossing once daily are important for oral health, they’re not enough to remove tartar. Only a dental professional will be able to remove tartar so you can better protect your oral health. Professional teeth cleanings remove harmful plaque and tartar build-up so you can avoid cavities, gum disease, and other oral health issues. You may even notice that your teeth are a little bit whiter after your teeth cleaning. This is because we’re often able to remove surface stains while gently scraping plaque and tartar. During your teeth cleaning appointment, we’ll be able to examine the inside of your mouth and take dental x-rays to catch issues early. If we find any problems, our teeth cleaning dentist will be able to recommend the best course of action to protect your oral health. Many oral health issues can be detected early during a teeth cleaning, such as gum disease or oral cancer. Our teeth cleaning dentist wants to help you maintain a healthy smile that’ll last for years to come. 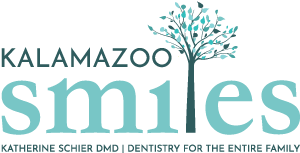 To request an appointment with our teeth cleaning dentist in Kalamazoo, MI, call Kalamazoo Smiles at (269) 353-3700.